I worry too much about having enough reading material for trips. I even installed a book reader (Mobipocket) and a few "emergency" books on my Blackberry for spare time tiny-screen reading (of course there's plenty of reading material on my notebook too). But still there must be books, and one dilemma is the hardcover, as in a book I am reading at home right now, Moon Lander: How We Developed the Apollo Lunar Module by Tom Kelly. It's good so far and I want to keep reading, but hardcovers are so bulky for trips. I'll probably take it anyway, along with a couple of backup paperbacks. One of these will be Hemingway's A Farewell to Arms, which I may have read in high school or college but don't remember. I'm hoping that some of Hemingway's spareness in prose will rub off on me. Not likely, I know. 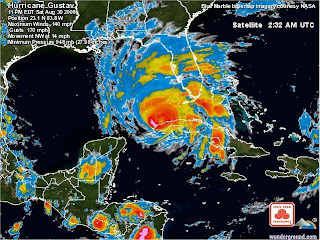 Satellite weather imagery is one of the best applications of space technology, and a real life saver when it comes to tropical storms like Gustav, which tore into western Cuba and is now strengthening and heading for landfall somewhere on the U.S. Gulf coast. New Orleans is under mandatory evacuation. This recent satellite image is a frame of an animated GIF from wunderground.com - the animation has a terrible kaleidoscopic beauty. The interactive tracking map (static frame below) from the same web site shows Gustav strengthening to Cat 5 in the mid-Gulf at 11 pm Sunday night, then weakening to "only" Cat 4 the following day, with the projected path reaching New Orleans with 138-150 mph winds, gusting to 167-184 mph. Cross your fingers (this is about as effective as praying). I'm heading to Glasgow, Scotland on Sunday for a conference, and I've been busy getting ready for that. I also helped my younger daughter move in for her freshman year in college. Yes, that does make me feel somewhat older. OK, old. So I haven't had much time for blog reading and writing this week, but I did watch a few of the speeches at the Democratic Convention, and I must comment on Barack Obama's amazing acceptance speech the other night. If you haven't heard this speech, it's well worth the 43 minutes to watch the video. There is plenty of information on the web and in Obama's books if you want to know who he is, what he stands for, and how he intends to lead this country. But this speech is a perfect introduction and summation. The big news that McCain used to divert attention from Obama's nomination was of course his bizarre vice presidential pick, Alaska Governor Sarah Palin. Palin has no national or international experience, and McCain himself has met her only once or twice. The choice smacks of political desperation, not to mention hypocrisy in McCain's repeated criticism of Obama as too inexperienced. McCain is 72 years old and has a history of skin cancer, so his VP choice is arguably more important than most, even though McCain claims to be in good health. Can anyone seriously suggest that Sarah Palin is prepared to be president? Of course sometimes a desperate "hail mary" play succeeds, and if Sarah Palin is really as amazing as this web site suggests, she may bring as much to the ticket as Chuck Norris could have if McCain had tapped him for the veep spot. P.S. I also want to recommend the 9 minute DNC Obama biography video that played before his speech, and this hilarious spoof Obama bio video from the Daily Show. The September issue of Wired magazine is really cool. 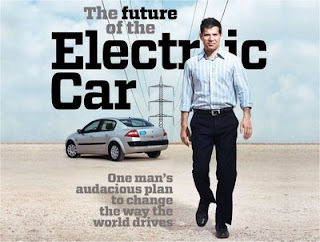 The cover story is about an amazing plan to fundamentally reshape cars and how we use them, by building a network of charging stations that will power electric cars whose batteries are owned and operated by the network company. Better Place is a strange sort of car company - more like a software or network company than a traditional car builder. They are partnering with Nissan-Renault to build the cars, and they have signed up Israel and Denmark as "beta test" countries. Yes, countries. Without the infrastructure of charging and battery swap stations, and the network and computer software that help drivers make best use of the resources, the plan won't work. So they need small countries that are willing to support this development with tax breaks and other subsidies, with the payoff being a transportation system that (eventually) doesn't need oil. I know it sounds wild, and it's hard to see how the infrastructure for this could scale to a big country such as the U.S. (they might start with Hawaii). But read the article - they are really serious about this! 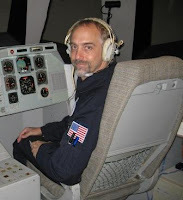 There are other cool articles too, especially the one about Richard Garriott. If all goes well this October, he will become the sixth private spaceflight participant to fly to the ISS on a Russian Soyuz. His training experiences at Star City were quite interesting (see the video on the Wired web site). You can also learn more about Garriott's $30 million mission at his own web site. But wait, there's more: an article about Neal Stephenson (one of my favorite authors) and his upcoming book Anathem. And an article about Red One, an amazing new professional digital video camera that finally achieves film quality (4096 x 2304 pixels). A very wired Wired this month. Yes, that's "Baracky" as in "Rocky." This video is "hard hitting" and pretty funny. Informative too. 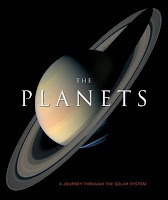 Emily Lakdawalla of the Planetary Society wrote an interesting piece last week, "Things that probably won't ever be called planets, but maybe they should." It's a reasonable sounding approach to the "planet debate" that was triggered by Pluto's "demotion" - "planet" is not a status to aspire to, but simply a name for an object that is smaller than a star, a name that can be qualified as needed with many descriptive words: terrestrial, gas giant, ice giant, dwarf, minor, etc. But whatever you call them, there are many objects worth exploring here in our solar system, and we have already sent spacecraft to visit many of the "minor" ones. Emily provides a photo album in this post. She also made a collage of all of the visited objects at a common scale, which she posted today. The 1600 x 1200 png file (537 KB) is really cool - it's quite an impressive range of sizes. This also reminded me that ESA's Rosetta spacecraft will soon be making a flyby of asteroid 2867 Steins on its way to a May 2014 rendezvous with comet 67P/Churyumov-Gerasimenko. 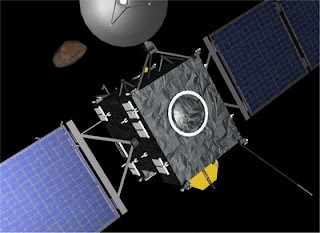 The picture above shows Rosetta (add-on by Brian Jones) with Steins as simulated in Orbiter. I'm at 145 km, a bit closer than the intended 800 km distance for next week's flyby. A friend and I went to Boston's excellent Museum of Science today. 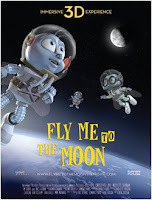 One of the things we saw was a 20 minute version of the current theatrical release movie Fly Me to the Moon 3D. This was actually a lucky thing, because I got to see what were probably the best 3D scenes in the movie (Saturn V launch, flies cavorting in zero-G, Moon approach and landing) while enduring only a few brief moments of the fly family and other cheesy dialog. I know it's a kids' movie, and you have to be willing to suspend some disbelief, but come on. The movie is notable in that it was produced fully and exclusively for 3D, and the 3D effects were truly impressive. I was thinking I'd have to see the full movie just to be able to mention it in my outreach presentations. But now I believe I can squeak by with just this mini-version. I still hope kids like it. We're about to head out for a weekend in Maine and New Hampshire with a friend visiting from Nashville, but before I take off to the webless wilderness, I'm checking out Carnival of Space #68. It's running this week at Crowlspace, with the subtitle "star-travel won't be easy." It's only about two hours to Ogunquit, but it looks like it will be a few more years before we'll be able to make the Kessel run in less than twelve parsecs. Although I have occasionally given money to candidates in the past, I have not gotten personally involved in a political campaign since I was a college student and worked for George McGovern in 1972! And while I've personally contributed money to the Obama campaign, asking other people to contribute money is just a bit beyond my comfort level. But guess what? When something is really important, it's time to push the envelope and forget about your comfort level. Because I care about this country and about our future, I believe we need Barack Obama to win this fall. And it's going to take money. Please take a moment to check out this page, and contribute if you can. Any amount will help. And if you care to, tell a friend. If you want to know about why I support Obama, I'd be happy to talk with you about it. Of course my page is open for anyone to contribute, and if you decide to, thanks in advance. If you prefer to contribute in another forum, or to another candidate, or not at all, that's fine too. We now return to our originally scheduled space, astronomy, science, and education "stuff." When I was a kid, I fell in love with flying and with space. I was 9 to 16 years old in the core space age years of 1962 to 1969, from John Glenn's first orbital Mercury flight to Apollo 11 landing on the Moon. I was also a cadet in Civil Air Patrol for several years in that period, learning aerospace subjects and taking a lot of Piper Cub orientation flights that gave me my first experience in controlling an airplane (cadets could do everything but land). I did everything I could to learn about space and aviation. In the sixties, I had network TV, LIFE magazine, and a lot of reports and posters that I requested from NASA and the US Air Force. I read library books, and when I occasionally got to the big library in Glens Falls, NY (we lived in a rural area and I usually got books from the Bookmobile) , I would read space mission reports in Aviation Week magazine. I also built a lot of plastic models - mostly military aircraft, but I also built every available spacecraft model - Mercury/Atlas, a large-scale Gemini spacecraft, and of course the Apollo spacecraft and Saturn V booster. Now in the age of the world-wide web, the amount of material that is available to someone interested in learning about space science and engineering is really staggering. In addition to NASA's huge presence on the web, there are many other sources of space and aviation information, pictures, and video. We have flight simulators, including Orbiter, an excellent and free space flight simulator. We even have aerospace courses from MIT available on the web! The latest space course from MIT's OpenCourseWare program is 16.89J from spring 2007, Space Systems Engineering. 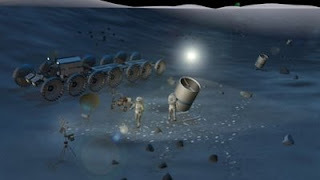 The project theme of this particular class related to the design and development of possible lunar telescope facilities, including scientific and technical issues as well as project management, budget, timeline, and other "big picture" issues. The materials for this course are limited compared to some MIT OCW courses. No PDF, audio, or video lecture materials are provided, but they do provide PDF's of the final Lunar Telescope Facility class presentation and report which are pretty impressive. One of the most complete space-related OCW courses is Aircraft Systems Engineering from fall 2005, which focused on the space shuttle. Instructors included MIT professor and former astronaut Dr. Jeff Hoffman, and the OCW material includes lecture notes, audio, and video. A more recent one that also looks cool is Engineering Apollo: The Moon Project as a Complex System from spring 2007. No videos, but it does have brief lecture notes and a number of student reports from the class, plus some historic NASA documents. White light LED's could literally light up the world for developing countries, making a huge difference in the lives of billions of people. A few years ago, a professor from the University of Calgary in Canada, Dave Irvine-Halliday, realized that lighting is a big problem for the nearly two billion people in the world who have no electrical service. Their lives are ruled by daylight, sometimes supplemented by dim, smoky kerosene lamps that allow them to do some limited activities after dark if they can afford the fuel. 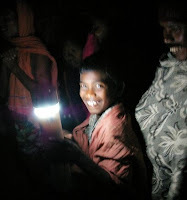 Light Up The World Foundation (LUTW) is the first humanitarian organization to utilize renewable energy and solid-state lighting technologies to bring affordable, safe, healthy, efficient, and environmentally responsible illumination to people who do not have access to power for adequate lighting. LUTW remains the world’s leader in this endeavour: globally active and setting standards in the field. LUTW is raising money for this effort, but they are also encouraging the use of microcredit loans to allow people to buy the necessary hardware with small payments that would otherwise go to buying kerosene for lamps. This also creates opportunities for local small businesses. They can assemble and sell lamps, batteries, and solar cells and even make money recycling batteries. This is a great application of optics, solid-state physics, solar photovoltaics, and other advanced technologies to solve a simple problem in a simple way, with immediate and local benefits. It's a great idea and a great cause to support. For more information, you can explore the LUTW web site, or read this technical paper (PDF) from SPIE. As reported by Jeff Foust in The Space Review this week, space policy is heating up this summer. In apparent reaction to Obama's recent Florida remarks on space, John McCain's web site was updated with an expanded article expressing support for NASA and for human and robotic space exploration. 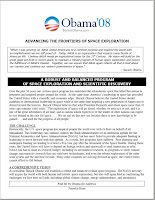 Now the Obama campaign has expanded even more on Obama's Florida remarks with a seven page PDF position paper entitled "Advancing the Frontiers of Space Exploration." This is quite detailed and includes ideas for better coordination on space activities among federal agencies, more support for private space activity, and better use of NASA's resources to educate the public and engage more students in science and engineering. Saying something doesn't make it so, I know, but establishing space exploration as an important part of America's future is a good first step. Curiosity got to me and I downloaded the free trial version of the Spore Creature Creator. I am most impressed with the UI (user interface) for this thing, and with the way the animation is implemented for anything you can build. If you watch some of the background videos from the Spore development team (especially this one on procedural animation), you can see that you are not as free as you seem to be in what you create - but it certainly covers a wide range. I played around and created a couple of odd dinosaur-looking creatures without making many changes to the basic parts beyond stretching and orienting them. But as you can see from this demo on advanced creature creation, just about everything is up for grabs. Basically whatever the UI allows you to create, works. I have vacillated between uninstalling this thing and paying the $10 to upgrade to the full one to see what the full set of parts looks like. What it looks like is a time sink, so I really think I need to remove it. Having seen some of the videos of the different phases of the game, I believe it will be a tremendously creative environment for "kids of all ages" - but I'm not so sure it will encourage science as much as (say) animation and graphic arts. In other words, I'll wait for some reviews and articles before deciding whether to use "educational outreach" as an excuse for buying and playing this thing! Whatever it ends up being, it certainly is impressive. Speaking of astrobiology (as I was in my last post), I just discovered this May article from SEED magazine. It discusses what sorts of signs of life a distant planet might display, using as an example the only planet that we know with certainty harbors life - Earth. It turns out they have done the experiments with several departing planetary exploration spacecraft, pointing their instruments back at Earth to examine our variations in brightness and color in various wavelength bands. When they do this, they see a planet with tremendous variation in color and reflectance, thanks to our oceans, clouds, and land areas. These variations could allow an observer with similar data to determine that we have areas of water and non-water, as well as how fast our planet is rotating. If they observed a wide range of spectral bands, they would find Earth to be quite bright in some long wavelengths (radio, TV, radar, etc.). With spectroscopic analysis, they would find the chemically unstable combination of oxygen and methane in our atmosphere (along with other gases), suggesting that some dynamic process is constantly replenishing these gases (that would be life, in our case). This gives scientists ideas for how they will examine exoplanets as our near-future instruments become good enough to discover and examine smaller and more Earth-like planets, especially any that lie within the habitable zone of their stars. 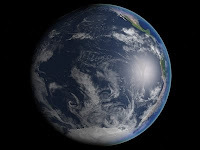 Even if the planet is initially represented by only one color pixel, the spectrum of that pixel, and changes in its brightness over time may give clues about its atmosphere, rotation, and the presence of large areas of water or other liquids. Habitable zone? If you need help with that, I recommend cribsheet #14 from SEED, a quick single page review of exoplanets, how we find them (over 300 so far, most very massive and Jupiter-like), and how we will be able to study these distant worlds in the near future. SEED has useful cribsheets on a lot of other subjects too. Check out plate tectonics, nuclear power, and light. In any discussion of space exploration with someone who is not already a space geek, the subject of life beyond Earth will usually come up. Whether it's the possibility of simple life on Mars, or speculation about possible intelligent life elsewhere in the universe (and whether "they" have visited here), this is one part of space exploration and astronomy that many people can connect with. Back in the sixties, Carl Sagan co-authored a book with I.S. Shlovskii called Intelligent Life in the Universe. I remember reading this in college (around 1973) and being impressed and fascinated with the interdisciplinary combination of astronomy, physics, geology, and biology. In fact this was an early work on what is now called astrobiology, a subject that was not all that respectable at the time. What is life? How did life arise on Earth? What do astrophysical observations tell us about the present and future of life on Earth? What kind of environments can life tolerate? How can we determine if life exists on other planets? How often can we expect to find complex life? What will life consist of on other planets? Will it be DNA/carbon based or based on something else? What will it look like? In a couple of weeks, Will Wright's long awaited "video game" Spore will be released, and as this article points out, it is very much astrobiology turned into entertainment. I'm really intrigued by this and will probably buy it, but as with other electronic diversions other than Orbiter (and flight simulators some years ago), I probably won't have time to explore it much. Even though it appears to play a bit loosely with some of the ideas of evolution and natural selection (it is a game, after all), I hope that it encourages interest in science, and better yet, helps to portray science as a creative and exploratory activity, which of course it is. 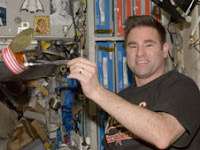 Carnival of Space #67 is available for your reading pleasure at David Chandler's Next Generation, a blog focused on the work of college students who are involved in astronomy and/or space exploration. I'm an optical engineer who works with optical design software, though most of the optical systems I have ever designed have been for training or software testing purposes - nothing I've ever designed has been built. I have gotten to tour a lot of optical shops and factories over the years, including a fairly large one in China a couple of years ago. They had a lot of people and machines making very tiny lenses for mobile phone cameras. The video clip above is from the Discovery Channel. It shows the largely manual manufacturing steps for a pretty large lens for a video application. High quality, low volume optics are still manufactured this way, though large volume fabrication in Asia is typically much more automated than this (but there are still a lot of people involved). Canon has a great "Virtual Lens Plant" site if you want to learn more about optical fabrication. For more information on what optical engineers do, watch this career-oriented video (about 15 minutes, in two parts). So where are the SPHERES? I've changed my blog template, at least temporarily. For reasons I don't have time to investigate right now, the background of my usual "dots" template has disappeared. I have occasionally messed up the blog's format by making some sort of mistake in a post, and other times I've lost formatting because of something Blogger has done (which they usually fix in a day or two). So I will use this one for the moment. Maybe it will be better for printing since the main text is on the left. Who prints a blog? Well, I print out each month of posts and put them in a loose-leaf notebook, just in case this computer and internet thing suddenly disappears. SEED magazine has interesting profiles and podcasts on some "revolutionary minds," including Michelle Borkin, a young astronomy researcher at Harvard who is working with a team in applying medical imaging and visualization software to astronomical data. The term "astronomical medicine" is pretty wild - who is the patient in this case? And will the insurance be accepted in this part of the Galaxy? I forwarded this to Martin Schweiger, the developer of Orbiter, who in his real job does research on medical imaging software. He agreed that this is really interdisciplinary research, "Although on the other hand, the connection isn't so far-fetched. I am using the radiative transfer equation to describe light propagation in tissue - and that was originally developed for modeling stellar atmospheres." So maybe it's really medical astronomy? Michelle Borkin has some nice images, movies, and background material on her web site. The other day I got another contribution request from the Obama campaign. This is not surprising - a presidential election is expensive, and I have already made a number of small contributions to the campaign. As I've said a couple of times before, I'm not turning this into a political blog, but I believe this election is really important. A win for McCain would extend the Bush disaster for at least four more years. It's all hands on deck for America. There's a new wrinkle in the latest request. To encourage prospective first time contributors, they tell them that another supporter (for example, me, for the amount I've already agreed to contribute) will match their contribution, and they optionally put the matching contributor indirectly in touch with the new one. I can write a message to my "match" explaining why I support Obama, and if they want to, they can write back. So far I've done four of the matching contributions, and gotten three replies. It's just a small personal touch, but I think it's pretty cool. Try it. Astronaut Greg Chamitoff, floating around on the International Space Station, is ready to answer your questions from orbit. Just use the form on this page. NASA says he will answer as many questions as his schedule permits. I know you have a pretty regimented work/sleep schedule, and I know there are frequent sunrises and sunsets in orbit. How does all this affect your sense of time? Do you ever experience something like jet lag on the ISS, a sense of being awake when your body "thinks" you should be asleep? I guess I'll have to check back periodically and see if it gets answered (they don't ask for an email or address or anything, just a name if you want to not be "Guest"). On Saturn's hazy moon Titan, torrential downpours of methane punctuate centuries of drought on a landscape of sand dunes and badlands. That quote is from a great article on Titan in the current issue of Physics Today, and I noticed that the full article is available online. "The changing face of Titan" by Ralph D. Lorenz of Johns Hopkins University integrates and summarizes a lot of what has been learned about this strange, cold, but dynamic world from the Huygens probe and especially from the many fly-by passes of the Saturn-orbiting Cassini spacecraft. 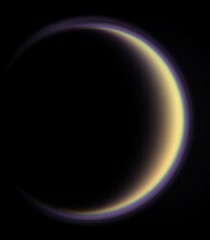 With the Cassini mission extended for two more years, scientists will have 26 more Titan passes to learn even more. There's an interesting article in The Space Review this week, "Saving America's space program" by Stephen Metschan. This relates to the DIRECT team's proposal for an alternate launch vehicle approach for NASA's Constellation program, one that is based more directly on existing shuttle and other launch vehicle technology and infrastructure. 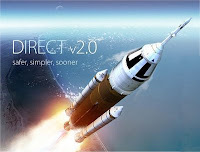 The DIRECT team claims that this approach can result in more capability, with faster and cheaper development and better safety margins, than NASA's currently planned approach, which includes the Ares I and later Ares V launch vehicles. NASA of course claims that they studied the DIRECT approach (among others) and found many flaws with it. They claim that the Ares I/V plans are better. You can read the materials on the DIRECT site and find all sorts of discussion on nasaspaceflight.com and other places on the web (the main Ares contractors' line is here). I frankly have not followed the debate that closely, but I am disturbed by some things said in Metschan's latest article, especially the suggestion that NASA plans to start destruction of the tooling and fabrication facilities for space shuttle external tanks as early as next month. I even wrote to my congressman and senators to ask that they look into this. If there is even the slightest chance that these facilities will be useful in the development of future launch vehicles, it seems crazy to destroy them now. I saw a TV special some months ago that showed some current NASA engineers visiting a California company that collects space hardware (bought largely as government surplus or scrap). They were searching for things like pumps from Saturn V rocket engines because the blueprints and tooling for these things had been destroyed when the Apollo program ended! I don't believe the government should save everything, but it would seem that design data for the only moon rocket we ever built would be worth preserving. I think there is a lesson in there somewhere! Let's hold on to the ET design and fabrication stuff for a while longer so we can be really sure we won't need it. It also seems very reasonable for Congress to order an independent design review of the DIRECT 2.0 approach to see if it really does have advantages over NASA's current Ares plans. I'm not saying who is right here - I'm sure it's not as simple as the PowerPoints and forum discussions may suggest. But the people involved are smart, they seem quite sincere, and they have put tremendous effort into promoting this alternative idea. I think the DIRECT approach is worth some more study. I am re-reading two wonderful books by the late Octavia Butler, The Parable of the Sower (just finished) and The Parable of the Talents (just started). Here's my discussion from 2006. On re-reading these books, I am again struck by how viscerally real and plausible this terrifying future seems. I hope this isn't where we are heading, but it could be. I’ve just finished two fine science fiction novels by Octavia E. Butler, The Parable of the Sower and The Parable of the Talents. Amazon somehow suggested them, and they did not seem at first to be the type of SF that I usually enjoy (I’m generally more of a “hard SF” fan). While I have read and enjoyed a number of SF novels of the near future post-apocalyptic genre, these books seemed to have a religious, cultural, and feminist orientation that I was not sure I would enjoy. But as it turns out, Butler was an amazing writer, there was more than enough realism, and even the religious aspects of the story touched me in unexpected ways. She brought me into a world that was in many ways uncomfortable to visit (largely because it seemed so plausible), and took me on a journey that was precarious, unexpected, thought-provoking, and ultimately rewarding. The quote above is taken from a fictional work of inspirational poetry by the main character of the two Parable books, Lauren Oya Olamina (Butler wrote the quoted passages from this fictional work, some of which are collected here) . She starts out as a 16 year old African-American girl in suburban Los Angeles circa 2027. Global warming and other severe problems have led to a near-total breakdown in American society, and she and her family live in a walled neighborhood surrounded by poverty and chaos. Her neighborhood is finally destroyed and most of her family and neighbors are killed, but Lauren manages to escape and to make her way to northern California. Along the way she helps, is helped by, and starts to gather a group of people with whom she later builds a small, self-sufficient community called Acorn. There are a number of special things about Lauren, but what is most notable is that since age 12, she has been thinking and writing about certain “truths” that she sees about the universe, about people and their problems and relationships, and about what the ultimate purpose or destiny of humanity might be. Through her writings and eventual teaching, she establishes a community-oriented, humanistic religion called Earthseed, with the central message “God is change” (her God is not a conscious entity, but more of an organizing principle) and the idea that humankind is truly “Earthseed” whose destiny is to take root among the stars. There is a long and torturous route to that destiny, and Lauren and her ideas are very nearly destroyed by "good Christian" citizens of an America that has descended into chaos, and whose leaders have allowed radical fundamental Christians to take over the agenda of what is left of the nation, forming what is essentially a Christian theocracy which bears more than a small resemblance to Taliban Afghanistan. In contrast, the teachings of Earthseed are inclusive, community-oriented, and flexible, with a text that offers inspiration and a base of shared ideas, some simple rituals that provide structure and are eventually comforting to members of the community, and which even provides a “destiny,” a long term and not immediately obvious goal – the idea of spreading humanity beyond the solar system, to colonize planets of other stars. This is the part that first appealed to me – and the fact that it was treated as a religious goal and not merely as a technological or economic goal was interesting and perhaps almost necessary. Maybe there is a little bit of “heaven” in the ideas of people (like me) who seek to send humans into space, to colonize Mars and other places in the solar system, and eventually to go beyond, to the stars. I don’t believe in any sort of immaterial soul or afterlife or in any sort of god who listens to and cares about people. I believe that as far as intelligence and purpose here on Earth, humanity is all there is (while not ruling out intelligent life elsewhere in the universe). But humanity and its civilization are enough, and we are well worth preserving, here and elsewhere, with the “elsewhere” part forming a sort of space-based backup plan. I don’t think it’s actually “destiny” but it is in our genes and in our culture, a logical extension of the part of us that says “take care of the children, they are your future.” That is the route to immortality – when we send our ideas and our children into the future, a little bit of each of us will survive too. Like Earthseed. Olympus Mons is the largest known volcano and mountain in the solar system. It reaches 27 kilometers above mean surface level (around 88,600 feet) and is about 550 kilometers in width. What would it look like to fly near this enormous thing? 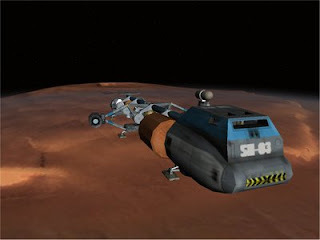 Tonight I downloaded from Orbit Hangar a newly posted Orbiter add-on by "ark," intending to have a look. This "Smooth Transition Olympus Mons" is a textured 3D object that blends nicely with Orbiter's normal flat Mars texture (all Orbiter default planetary textures are smooth, which doesn't matter much as long as you are a few hundred kilometers up). 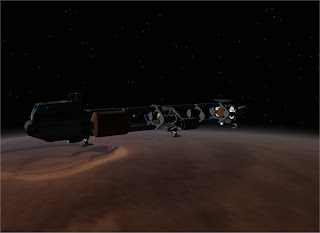 From Olympus Base, you can now see Olympus Mons low and wide on the horizon. It rises with such a gentle overall slope that you have to fly around and above it to get a sense of its real size. In the pictures here, you can see the steep cliffs and the giant caldera of the volcano. It's a pretty nice effect. There's a new search engine in town, cuil.com (pronounced cool). Several ex-Google people created this new search engine, which like Google itself, aims to index everything on the web. After some brief and non-scientific testing, I think Google is safe for a while. Cuil includes pictures in some of its results, but when I did searches that included some results from this blog, if a picture was included, it was not from my blog. I noticed on some searches for my own music that some of the returned pictures are from me, but they are from web sites that are completely unrelated to the site where my music was found (e.g., Orbiter graphics or air show photos). Weird. A simple search such as "starfest aldrich" produced no results (Google: 504, including several hits for recent blog posts of mine on last night's excellent Starfest event). Changing the case of s or a changes the results but not very usefully (why should a search string be case sensitive unless this is a preference setting?). I did a bunch of other searches for things where I know what some results should include (e.g., in optical design and illumination simulation), and cuil's results were disappointing. Sometimes I use Yahoo search in addition to Google, just to see what shows up near the top. I might use cuil the same way sometimes, but based on my limited testing, this is 1.0 software and doesn't seem to bring much to the party so far (wait for 2.0). I just stumbled on a really cool web-based activity that has apparently been around since 2005 or maybe earlier. 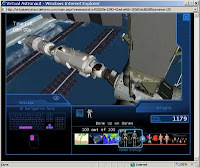 It's called Virtual Astronaut, and it puts you inside a 3D model of the ISS. 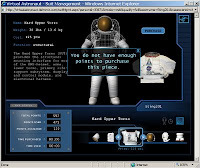 You can fly around and locate various activities, which are brief educational modules on subjects like bones, muscles, plant growth in space, recognizing Earth features from space, and others. Most of them are biological or medical in nature, relating to the challenges faced by humans living and working in space. Each activity ends with some sort of quiz or puzzle for which you gain points. Gain enough points and you can go to the space suit fitting area to purchase the components and assemble your space suit, and then buy 2 minute blocks of EVA time. 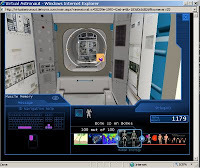 Go to the airlock, press O to open the hatch, and you can then go outside and explore the 3D exterior of the ISS. There are no EVA activities other than floating around and looking, but it's still pretty cool. Most of the activities seemed suitable for elementary school kids, though the ones involving muscles, bones, and the inner ear had some tough vocabulary to learn (the activity itself teaches you the vocabulary, and you can repeat each activity as often as you like to increase your score). This "learning environment" was probably developed for NASA by Tietronix, though I can't see an "about" page for background so I don't know. It's well designed and easy to navigate. It requires downloading and installing a couple of plugins including one for a 3D viewer (though there are Flash-only and text versions also available). I think this would work really well with Marianne Dyson's book Space Station Science which I have mentioned in a past post, providing a way for students to explore the ISS after they read about it (the book also has various activities). 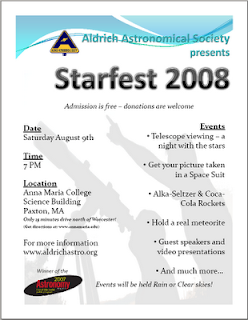 ...this weekend, don't forget Starfest 2008 tomorrow night at Anna Maria College, near Worcester. It's free and will go on regardless of weather, though we hope for clear skies when the telescopes open up at 9 pm. There will be many indoor activities too (in Foundress Hall, not the Science Building as shown above). I will present "Robots, Astronauts, and You," including some live and noisy Orbiter demos. Bring the kids! Carnival of Space #66 is running this week at A Mars Odyssey. Check it out. This graphic isn't part of the carnival, it's just a screen shot from Orbiter of Phobos with Mars in the background. 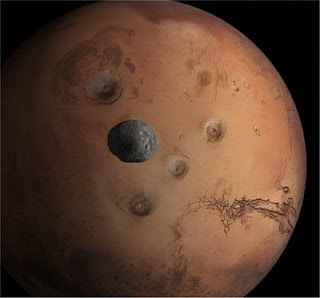 Olympus Mons is at the upper left, Valles Marineris is at the lower right, and the three other volcanic mountains to the right of Phobos are Arsia Mons, Pavonis Mons, and Ascraeus Mons. I'm a nerd, and proud of it. Believe me, only a nerd would say that and link the word "nerd" to the Wikipedia article for nerd. Not to mention that I'm a space blogger and this is, what, my fourth post of the day? But enough about me. Almost. Thanks to Martin Schweiger, the author of the Orbiter space flight simulator, I now have the chance to be mildly famous among German nerds, or at least those German nerds who read a popular biweekly computer magazine called c't. The current c't has one of their occasional bonus cover DVD's, this time including software with the theme "Wissenschaft" (science). Martin was asked to allow Orbiter to appear on the c't cover DVD, and he kindly suggested that they also include my Orbiter tutorial and exploration guide, Go Play In Space. And they did. I hope their inclusion on the DVD allows many German c't readers to discover and enjoy Orbiter. I just received a copy of the magazine and I see it's in there, along with many other free software offerings of a sciencey nature. I can only read a little German, but I see that many of the programs on the DVD are actually in English. I noticed and installed one called Periodic Table Explorer by Paul Alan Freshney. Why? See paragraph one. The periodic table is a thing of beauty, OK? Elon Musk of SpaceX has reported the details of what went wrong on the third launch of the Falcon 1 the other day. It was a case of a few too many uncontrolled variables. This was the first launch with the re-designed Merlin 1C engine which uses a different cooling method from the original version (it circulates cold fuel through tubes inside the engine nozzle rather than lining the engine bell with a material that removes heat by slowly burning away). The new engine had a small amount of residual thrust after shutdown, too small a pressure to measure in ground tests, but at 200 km up, enough to bump the first stage into the second stage just after it had separated. 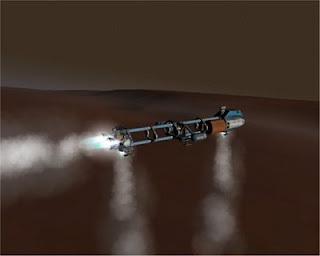 A very slight delay in staging would have allowed this tiny excess thrust to dissipate and staging would have succeeded. Everything else about the launch to that point went well, and they may try flight 4 as early as September. Of course there is a tendency to second guess things like this, or to rationalize them, or both. You might think that with all the experienced engineers SpaceX has hired, and with all the engineering and simulation tools that are now available, that a relatively simple two-stage booster would be "easy" to get working. After all, governments have been launching things like this since the late 1950's. But on the other hand, a rocket is a "full up" system, with lots of interacting stuff. 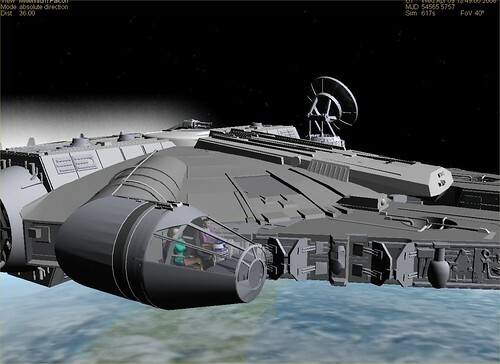 Simulation is great, but there's nothing like a full-up test to truly see how everything works together (or doesn't). Viewed this way, three test launches are really not a lot to get the bugs out, especially when the third flight had a substantially redesigned engine. This is rocket science, after all (really rocket engineering, but OK). As an example of more extensive second guessing, this NewScientist article talks about how much better reusable systems would be for development - you get the vehicle back to check out and improve after the flight instead of every launch being brand-new never-flown hardware (the first stage of Falcon 1 is ultimately intended to be recovered by parachute and re-used). Of course fully-reusable launch systems (space planes or whatever) should be the ultimate goal. As they say, we don't throw away a Boeing 777 after one flight. But we know from NASA's experience with the shuttle and various proposed systems (the National Aerospace Plane SSTO?) that full reusability is a whole different level of complexity, and SpaceX believes that at this stage, there are still economies of scale that are possible for expendibles with modern hardware design and fabrication, modularity, and other techniques. The fact that they are working out the bugs with the single engine Falcon 1 means that things should go better next year with the Falcon 9 that uses nine of the Merlin 1C's in its first stage. Starting with a clean sheet of paper in something as complex as launch vehicle development is a tall order, and you have to give Musk and SpaceX a lot of credit for taking this on and sticking with their plan. The above video is "a message for the next president of the United States" on the subject of space based solar power. I agree with the motivation, concepts, and the long-term need, though I'm not sure about all their numbers. They say that our usable oil reserves will only last 45 years. They say that even if we tap all available Earth-based alternative energy sources, we will still be short about 66% of world-wide energy requirements in 2100. There are a lot of assumptions and extrapolations in figures like those on both the supply and demand sides, and they don't say anything about their sources or calculations (a lot of the background seems to be here). But they finally suggest that you Google "space based solar power" to learn more, which is a good idea. I do love the line, "when it comes to energy, it's time to drill up, not down." Read the transcript here. Thanks to Louise Riofrio for the tip. She referenced NSS, and NSS also provides a link to a 5 minute ESA video on space based solar. That video is much less political and includes a really interesting graphic of historical energy use. NSS is a great resource on space based solar power. Even with millions of astronomy and space images freely available on line, I still like books, and I have tons of them on space and astronomy and many other subjects. Old habits die hard I guess. I sometimes also give away books as raffle prizes at educational outreach events, so I'm always looking for good quality, low cost astronomy books to use for this (and to add to my own overcrowded shelves). One series I really like is from UK publisher Quercus, Earth and Universe by Nicolas Cheetham and a third one I found just last week, The Planets by Giles Sparrow (the Amazon links are for hardcovers for $15 to $19 - I've found the paperback versions for $5.99 on the discount tables at Borders and Waldenbooks). They are basically all photos with brief text captions for each one. They are large format books and the color print quality is good. If you want to start or add to a low-cost astronomy library for yourself or your kids, you can't go wrong with these. My favorite down-to-Earth space application is GPS. I secretly had a simple Magellan 315 back in my student pilot days (2000-2001). I say "secretly" because I wasn't allowed to use a GPS for navigation as a student pilot, though I used it on my solo cross-country flights anyway, to back up my visual, chart, and VOR flight planning and navigation. I bought an add-on aviation database for that GPS (it was mostly intended for boating and hiking but it worked great in the air). Apart from my CFI's rules and the fact that I was only flying VFR, that GPS was not certified for aviation use, so it couldn't be anything more than a backup navigation device anyway. It was cool to know my real groundspeed all the time. For the last few years I've had a small Garmin GPS for the car, probably one of the last non-touch-screen models they made. We used the British English voice and called her Lucy. Lucy helped out on many road trips but her ~2006 database was getting a bit dated and would cost about $70 to update. 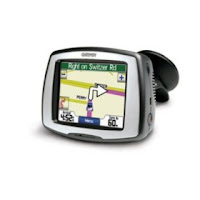 So I looked into other Garmin units and bought a StreetPilot c550 for $184 from Amazon (now it's $170!). This is a highly rated 2006-era touch-screen GPS that is compact but not super-slim like the latest ones, so I guess that's why they are discounting them. When I registered the new GPS with Garmin.com, I got a free update to the latest 2009 firmware and North America navigation database, which I downloaded (2 GB!) and installed. It's a fantastic little device. My new road companion is a saucy Australian girl named Karen (she's actually a synthesized voice who unlike Lucy can pronounce street names). The c550 also comes with an FM radio receiver cable and a three-month trial subscription for real-time traffic reporting. It displays and navigates around construction, accidents, slow traffic, etc. There are thousands of "points of interest" (POI) built in, and you can add your own for various things including audio-visual guided tours that some people record and provide on the web. It even includes an MP3 player - not that I need that in a GPS. My only disappointment is with another unexpected feature, Bluetooth cell phone support. This allows you to use the GPS on your windshield for hands-free phone calls. It's got some great features, but unfortunately it won't stay connected to my Blackberry's Bluetooth, even though I updated to the latest firmware and software. I don't talk on the phone that much in the car, and I have a Bluetooth headset for when I need to be hands-free. So I won't hold this against Karen or Garmin. Stuck on the Blue Marble? The sad truth is that 90% of the American populace don't give a flying fig about space exploration. Once Apollo failed to morph into Star Trek, they lost interest, and Presidents and candidates ever since have followed suit by ignoring the issue. It's time to face the fact that we're bound to this blue marble forever. True enough that most people don't care about space exploration per se. They also don't especially care about materials research that gives them hard drives for their iPods, biological research that might someday lead to useful new drugs, and many other wonky things that engineers and scientists do. They mostly care about results that can benefit them, and to a certain extent they enjoy novelty for its entertainment value. People like things that space technology has given us, like hurricane warnings and GPS, though this stuff happens mostly near the Earth and without astronauts, and most people don't think much about the space connection anyway. Some people do care about national competitiveness and technology when it affects jobs, especially their own. But apparently not enough to demand better education systems let alone space exploration. That's a problem that will be solved, in some countries at least. Apollo is still a tough act to follow. So many things went well and so much money and priority went into it in those few amazing years, and it was also quite novel and entertaining (for a while). So I can understand your cynicism and pessimism. But "forever" is a long time. I'd love to see humans on Mars in my lifetime, but it may not happen for 50 more years. I'd love to see Americans as key partners when it does happen (I hope and assume it will be an international effort). But maybe it will be the Chinese. And maybe it will take another full-blown space race or a near-hit by an asteroid to really kick things into gear. Or maybe it will only take a couple of companies finally making a big profit in space and going public. It could go many ways. I went into a technical field myself because of Gemini and Apollo, and many other engineers and scientists were similarly inspired. This was the "human spinoff" from the space program of the 60's that greatly helped the development of US technology businesses for many years afterward. It's easy to be cynical and pessimistic, but I believe optimism is a better strategy. Maybe nothing much will happen in the next 8 or 15 years, but I'm optimistic that space will open up vast new opportunities for mankind, and that new discoveries and developments will come along that will again make it exciting to more people. This blue marble isn't so bad. We can still do a lot with it and we should. But "bound here forever" is a lot like those predictions of respected physicists and others who confidently said in 1902 that heavier than air flight was essentially impossible. It's a very shortsighted view, unless your "forever" only extends through an administration or two. At the end of last week's Carnival of Space #64, I compared the perspectives of one of the blogs I was hosting (21st Century Waves) with a recent article by Rand Simberg in The Space Review. The subject was "are we driven to explore?" While browsing a few blogs tonight (catching up after my Taiwan trip), I came across an interesting followup on Rand's article at Centauri Dreams, in a post titled "What makes us explore?" (thanks for the kind plug, Paul). While Paul believes there is some sort of "exploratory impulse," he also finds more common ground with Rand than the terms "fear and greed" might imply - it seems that Rand's emphasis is more on space development than space exploration. Is "space development" better or more inspiring than "space exploration?" I guess that depends on your point of view, and if you read the animated exchange of comments for that post, you'll find that the points of view are pretty diverse (and culturally loaded!). I think some people do explore for the sake of exploration, though perhaps not very many people have been driven primarily by this. And I think there is a lot of overlap and synergy between exploration and development - something like science and engineering. There's no one right answer here, but I do find that in my recent outreach presentations on space, I have been talking more about private space and about the possible future economic benefits of space, while still highlighting the wonder and beauty of what we find in the cosmos. In the long run, I think space can be good for the soul and good for the pocketbook. Although political "flip flopping" is sometimes condemned as if it were a crime, let's face it - politicians are always adjusting their positions and sometimes even reversing them. Situations change, new information and analysis becomes available, mistakes are made, strategies are changed. If there's a good reason to change a position, and if the candidate can explain and justify it, it's crazy to stick to the original position for its own sake. This doesn't mean that it's OK to just say whatever you want for the circumstance or the current audience (besides, for a presidential election, the whole world is your audience anyway). Consistency is important, but I think it's most important to be consistent at the big-picture level of what's good for America. Of course if candidates change their positions too much or too erratically, their opponents will point this out, and if those positions are really not workable and good for America, the people will see this too and vote accordingly. McCain and Obama have both changed positions on issues, and today it seems that Obama has significantly reversed his previous position on space exploration and NASA. He had originally proposed delaying the Constellation program by five years and using the savings to fund an early education program. I disagreed with this position because I believe the savings would be too small to make a difference in any significant social program, and because NASA and its work force are an important national resource that would be difficult to rebuild. Even with the growth in private space (which I believe NASA should be funded to support at a higher level), I believe that NASA's 0.6% of the Federal budget represents a true investment in our future, unlike so many other Federal programs. "More broadly, we need a real vision for space exploration. To help formulate this vision, I’ll reestablish the National Aeronautics and Space Council so that we can develop a plan to explore the solar system – a plan that involves both human and robotic missions, and enlists both international partners and the private sector. And as America leads the world to long-term exploration of the moon, Mars, and beyond, let’s also tap NASA’s ingenuity to build the airplanes of tomorrow and to study our own planet so we can combat global climate change. Under my watch, NASA will inspire the world, make America stronger, and help grow the economy here in Florida." I mentioned Starfest 2008 in an earlier post, and now it's just one week away (August 9, 7-10 pm). Aldrich Astronomical Society president Jim Zebrowski was interviewed by the Worcester Telegram & Gazette and a nice article on Starfest and Aldrich ran on Thursday. Update: I learned today that Anna Maria College will be painting and rewiring the Science Building during August. This means that we will have to move Starfest to another building at AMC, Foundress Hall (#19 on this PDF campus map - telescopes will still be set up behind the science building, #28). Directions to Anna Maria's Paxton, MA campus (near Worcester) are here. I received two news emails from SpaceX today. 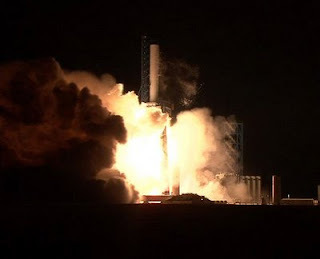 The first one said that they successfully conducted the first nine engine firing (pictured) of its Falcon 9 launch vehicle at its Texas Test Facility outside McGregor on July 31st, two months ahead of schedule. This is the full engine complement for the first stage of the big vehicle that will carry cargo and eventually passengers to the ISS in the next couple of years. 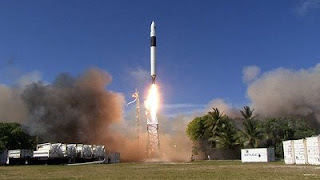 The other big news is that they plan to launch the Falcon 1 this evening from Omelek Island at Kwajalein Atoll in the Pacific Ocean. The launch window opens at 7 pm EDT (4 pm PDT) and there will be a live webcast of the launch. I will be at an astronomy club meeting this evening and I hope we can get web access to watch this (our usual university meeting place is being painted so we have to meet in another building). I can always tether my Blackberry if there's a good Verizon signal but I'm not sure how well that will work on streaming video! This will be the third launch of the Falcon 1. The first two tests failed to achieve orbit, though the second demo flight in March 2007 came close. I'm sure they have worked out the design problems discovered in the earlier tests and I look forward to a successful launch tonight. UPDATE: After several delays and an aborted launch attempt, the Falcon 1 was launched at 11:34 pm EDT. Unfortunately at about 140 seconds into the flight, an unidentified "anomaly" was reported and the webcast ended. The vehicle was apparently lost. I read later that the second stage failed to separate. This is a big disappointment for SpaceX and private space fans, but they will press on. "For my part, I will never give up and I mean never," SpaceX president Elon Musk said. Carnival of Space #65 is on display this week at 21st Century Waves. As usual, there's a wide range of space and astronomy topics to explore, which is also true of the 21st Century Waves itself. This blog takes an interesting approach to forecasting space development and eventual colonization based on long term economic and technological patterns.